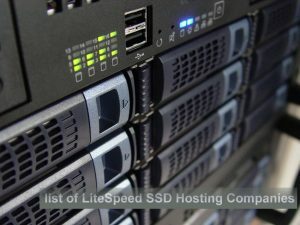 Today’s post is about giving you the full list of LiteSpeed SSD web hosting companies, and our honest recommendations. While we don’t expect a hosting company in this age to use spinning hard disk drives (HDD), some still do, which is why we’re giving preferences to SSD (solid-state drive) LiteSpeed hosting companies. Come along with me as I take you through the full list of SSD LiteSpeed hosting companies for business hosting, email hosting, VPS, and dedicated services. A2 is a popular web hosting company which offers a lot of hosing packages at competitive prices. The company offers shared hosting, dedicated WordPress hosting, VPS/dedicated server hosting, reseller hosting, and domain registration services. All of the A2 hosting packages come with enticing features which are suitable for personal websites, small businesses, large companies, and all, depending on the business size/needs. Also, you can engage the company’s team of experts to move your website files from an old server to theirs. A2 hosting uses the LSWS (LiteSpeed Web Server) technology for most of their server plans, and the LiteSpeed cache plugin for their Turbo hosting plan. Some of their plans and packages are listed below for your perusal. MDD hosting offers huge discounts for the first month on all of its hosting plans. It is a very formidable host with robust hosting plans. While not so popular, MDD hosting is renowned for speed (all thanks to the Litespeed server utilization), robust infrastructure, security, and reliability. The company has a very responsive customer support team and also lets you brand their hosting as a reseller. Liquid Web hosting is a web and email hosting company that offers managed web hosting services at comfortable prices. It utilizes the Litespeed web server to speed up its web server performance. Liquidweb customer support is excellent and easily up there with the top best hosts with a responsive technical support team. They have a wide variety of plans to choose from, depending on the package that meets your business goals. KnownHost is my “go-to guys” for a robust managed VPS hosting. They are a US-based web hosting company that’s renowned for excellent uptime, reliability, security, and scalable managed VPS hosting plans. KnownHost also offers domain registration services, domain name transfer, email and white-label reseller hosting for businesses. Additionally, you can engage the team to migrate your blog/website for free when you buy a qualifying hosting plan from them. For over a decade now, Hawk Host has been in the business of providing robust and high-quality web hosting solutions, as well as domain registration support to lots of people worldwide. Actually, it is a Canadian hosting company with US and Europe server locations. Its hosting packages are feasible, scalable, and reasonably priced. Hawk Host support is responsive, and they also offer free migration service to their new customers. For over a decade already, InterServer has been delivering quality web hosting solutions to individuals, businesses, schools, churches, and not-for-profit organizations. InterServer operates from the United States and also includes domain name registration, email, and VPS hosting in their range of services. Their hosting, domain name, SSL, and dedicated services are accessible worldwide to anyone who needs such a solution. Host winds provide different kinds of hosting solution to users worldwide. The company has a reliable customer support team that attends to all your need and queries. Its plans and packages pricing are customer-friendly, and it promises a 99.9% server uptime. Their hosting plans come with Litespeed server and LiteSpeed cache integration. VentralP hosting company is top-rated in Australia: They provide fast and responsive web hosting services with the award-winning Litespeed server across all their hosting plans and packages. An overview of their pricing structure is presented hereunder. SimpleServer is a top British web hosting company that offers a lot of web and email hosting services. Magneto (SimpleServers) web hosting is reliable in terms of server uptime, speed, and customer support. This is yet another UK-based web hosting company you can trust for all your hosting needs. ClookInternet is renowned for providing competitive web hosting services; its shared hosting plans are among the best you can buy from a UK-based hosting company. Also, you can buy and register new domains with ClookInternet. The name “Beyond hosting” is trendy among European users. It is another top hosting company that makes use of Litespeed server technology to power up websites that are hosted on its hosting infrastructures. Irrespective of how many visitors your website receives in a day, there is a suitable plan for it. With the help of ultra-fast, LiteSpeed-powered secure cloud server hosting, Guru is one of the best UK-based web hosting company you can trust. The company offers great prices for its hosting plan for all kinds of popular web apps (WordPress, Joomla, Drupal, and others). Also, you can be a GuruHost reseller, and the pricing is typically customer-friendly. Most interestingly, Guru host lets you try out all their web hosting packages for just $1.32 before you can start using them. This means that – for Guru’s Shared, Reseller, Managed, and Dedicated web hosting, you’ll spend only $1.32 for the first month, after which you’ll start paying the actual price from the 2nd month and subsequently. Aspiration hosting, though not so popular to most users, is a web hosting company that offers an array of hosting web services and solutions. It operates with Litespeed servers and currently powers thousands of websites online. Aspiration hosting plans are feasible as well as suitable for all kinds of web applications. MX hosting is a top Romanian web hosting company which also utilizes LiteSpeed servers to power up the sites on its database. They offer you some discount for the first month your website or blog will be hosted on its servers. The company’s support team are responsive. Plus, its hosting packages come with good features. Crucial hosting is an Australian hosting company that provides website and blog owners with comfortable web hosting plans that are supercharged with trendy features. The Crucial host servers are reliably fast, robust and very efficient. They typically promise their customers a monthly server uptime of 99.9% or higher. Proper web hosting company operates from Norway and offers all kinds of hosting solutions which includes magneto hosting, Joomla, Drupal, and WordPress hosting services. They utilize the Litespeed web server to ensure that all application and sites that are hosted on its platform are always up and running with fast-speed. There are quite some reasons why you may prefer this web hosting company over the tons of them which are available. The company has a suitable plan for all kinds of hosting needs, ranging from shared server hosting to personal/dedicated hosting support. Also, its plans are available at great prices. With reliable hosting servers across the USA, Canada, UK, France, and Germany, HostXNow is one of those top web hosting companies you can conveniently move your existing website/blog too. It offers various plans which are suitable for any kind of startup, business, as well as personal and professional uses. Also, this web hosting company offers email hosting and domain registration services. This is yet another top web hosting company that’s headquartered in the United States. It allows you to host your files, websites, and blogs on its servers when you choose any of its flexible plans. HostMantis also makes use of the Litespeed web server to provide its users with the best server speed and uptime. Fast speed and unfailing server uptime are among the core needs of anyone that’s seeking for a better hosting solution. Interestingly, Exon web hosting company provides these basic needs, with the help of Litespeed server, caching, and professional optimization. The company boasts of utilizing new and robust solid-state drives (SSD) for all of its hosting plans. Hereunder are the other hosting services providers whose servers are powered by LiteSpeed server. The popular LiteSpeed cache plugin can be used on any of these hosts, including the ones that are listed atop the list. While we typically recommend LiteSpeed SSD hosts, it is important to understand that as every business is peculiar, so is their hosting needs. For Cloud SSD hosting, we recommend any of Cloudways, LiquidWeb or KnownHost. For WordPress hosting, we recommend SiteGround, A2 WP or Kinsta. MDD Hosting, Stablehost, and Squidix are what we recommend for shared/business hosting. The only exception is simple/basic websites such as – a website for a local Coffee shop, hair salon, clothing alteration/Tailor shop, etc. where a very cheap hosting service such as the shared hosting plan from NameCheap can be used. For unmanaged SSD VPS hosting plans, we recommend any of Vultr, Digital Ocean or Linode. Do you have an excellent hosting company you have used and would like to recommend to our readers? Share them with us below, also feel free to ask us questions about hosting, LiteSpeed server, etc. Ebuka O. Samuel is a technical writer at 3rd Planet Techies Media. He's a tech enthusiast, Android gadgets freak, consumer electronics tweakstar, and a lover of wearable techs.